Healthy cooking methods preserve the nutritional value of foods and also maintain their natural flavours. Preserve the maximum nutrients when cooking vegetables using these healthy cooking tips. Once picked, the quality of most fruit and vegetables begins to decline immediately. Pick vegetables from your garden just before you start cooking. Shop more frequently for fruit and vegetables and use them as soon as possible. Keep fruit and vegetables fresh for longer by storing them appropriately. Water soluble vitamins (C and the eight B vitamins) are degraded by heat, air and light. Fat-soluble vitamins (A,D,E & K) degrade when exposed to air and light. Fruit and vegetables stay fresher longer with their natural coatings, so don’t wash until you’re ready to use. Cutting up produce early allows dehydration and nutrient loss. Don’t thaw frozen vegetables before cooking and cook just long enough to re-heat them. The skin of fruit and vegetables contains fibre, and the flesh nearest the skin often contains the highest amounts of nutrients. 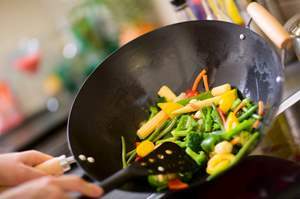 Stir-frying is a healthy cooking method that results in a colourful, crispy and delicious meal. You can incorporate a variety of vegetables in a stir-fry and flavour with ginger, garlic, lemongrass, chili, soy sauce or sesame oil. Only use a small amount of oil brushed onto the pan’s surface rather pouring it in. One of the techniques of healthy cooking is to spray vegetables lightly with an oil spray rather than roasting them in an oily tray. Pre-cook vegetables by steaming them then bake for a shorter length of time than usual e.g. steam potatoes until tender, spray, then bake in a hot oven to crisp up. Don’t roast vegetables in the same tray as the meat, as they easily absorb the fatty meat juices. Marinate meat in herbs to combat the cancerous compounds created by grilling and barbequing. Studies have shown that cooking meat at high temperatures causes formation of cancerous compounds. Herbs are high in anti-oxidants that reduce the creation of these compounds during cooking. Marinate meat using herbs such as oregano, thyme, rosemary, garlic, marjoram, parsley and basil. These herbs can also make a tasty and health-giving marinade for grilled vegetables. Check out this article on how to grill vegetables and learn to make easy grilled vegetables a satisfying and tasty addition to your BBQ party. Brass and copper pots are potentially toxic and can react with vegetables to cause oxidation and discolouration. Keeping food warm destroys vitamins, especially vitamin C.
Milham, Caron (2008). Australian Healthy Cooking Guide. North Sydney, N.S.W. : Random House Australia. Murdoch Books (2001) Healthy cooking : A Commonsense Guide. Millers Point, N.S.W. : Murdoch Books.